1. 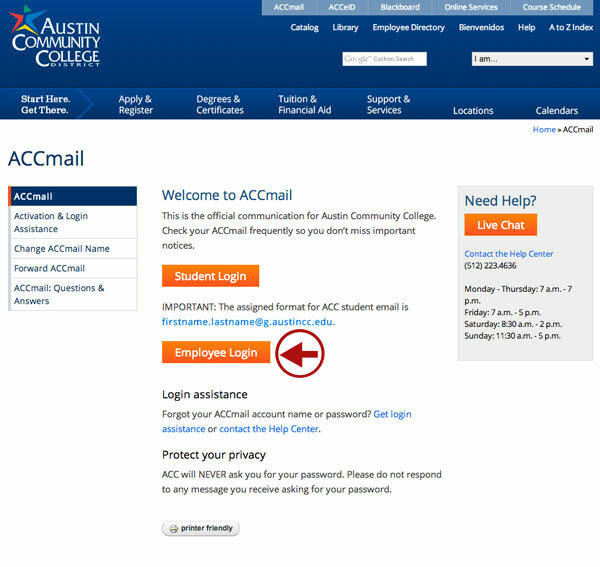 Login to your ACCMail Account. Create a folder if needed for your website documents or select a shared folder. Note: You can put any file in a folder and manage its overall shared permissions, or share documents individually. See this tutorial for a reference on folder sharing permissions. Select the up arrow just to the right of the “Create” menu on the left side of the screen. Then select the “Files…” menu item. Select a file to upload. Navigate to the file you wish to upload and link to. Select “Open“. Confirm upload settings. Remember that Google Drive will upload the file to the folder/area you have selected under “My Drive”. 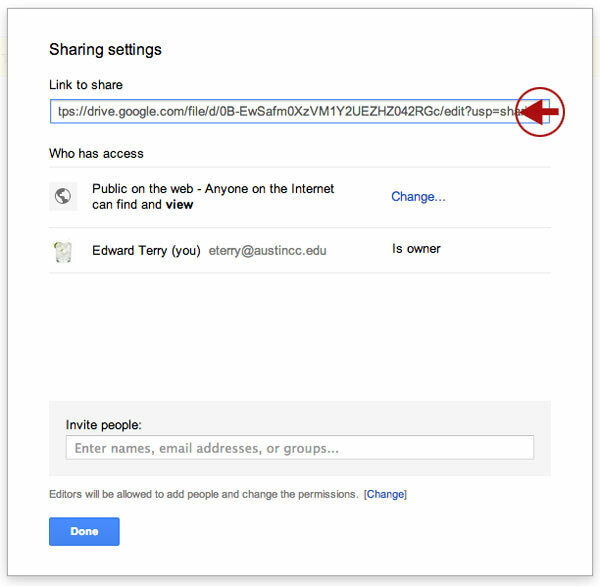 Select “Upload and share” to begin uploading the document. 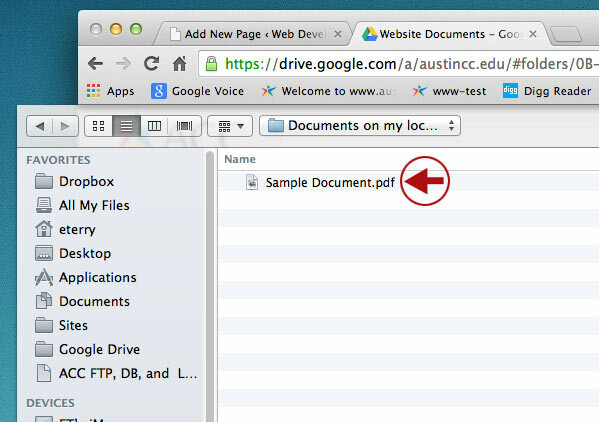 Google Drive will convert files to the native Google Drive format upon uploading if desired. It is recommended that ACC users uncheck these options for now and keep files in their native formats. 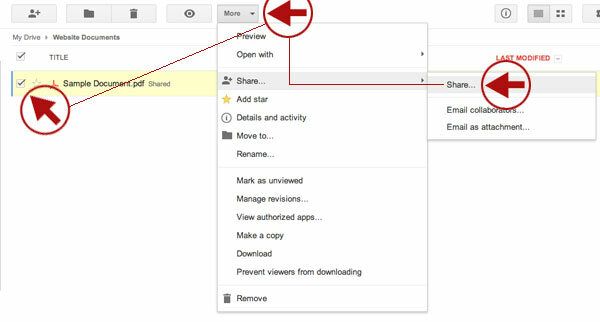 Google Drive will also confirm or ask users of this option each time a file is uploaded. As soon as the file begins uploading a status window should appear. 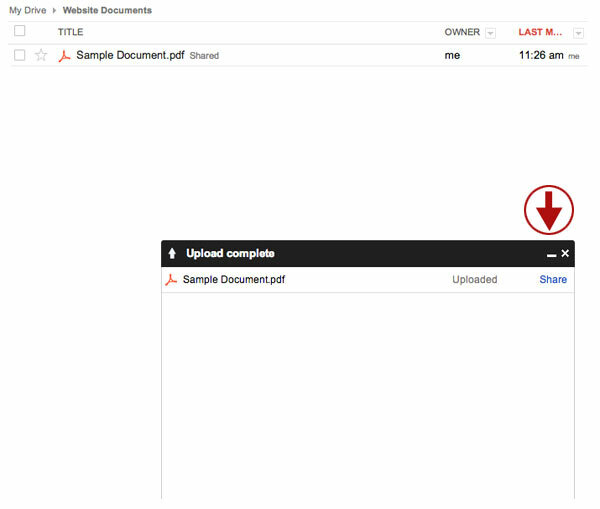 When the file has been uploaded to Google Drive the status window will display “Upload Complete“. At this time users have the option of going to the presented “Share” menu shortcut, or closing out the window. For this tutorial the closing of the window is recommended so that the steps to navigate to the Share menu can be presented. Select the “x” to close the status window. Select the small checkbox to the left of your uploaded document. Then select the “More” menu item and navigate to the “Share” menu item from the drop down. Select the “Share…” menu item from the fly-out menu. The window that appears displays the direct link to your uploaded document as well as “Who has access” details. Highlight and copy the “Link to share“. Be sure to get all of it as it can be quite long. Tip: It is helpful to paste the link into a text file using NotePad, TextEdit or some other text editor for easy access later on. Select Done once you have the URL copied and saved. This is the link that you want to copy. Copy and Paste this link Provide this link into emails, forms, or however is needed.